A run of gloomy news—more partisan disagreement on raising the debt ceiling, rising unemployment numbers and continued housing woes—drove the economy to the forefront of the media agenda last week. 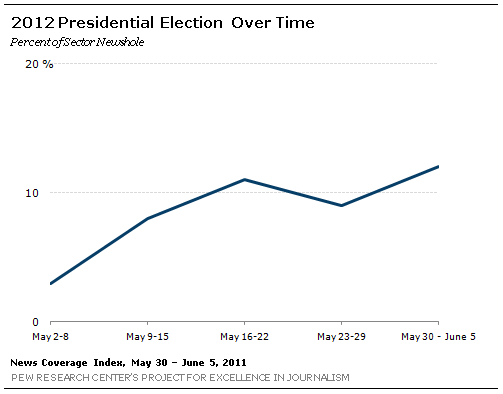 As the recovery appeared to falter, the U.S. economy accounted for 19% of the newshole during the week of May 30-June 5, according to the Pew Research Center’s Project for Excellence in Journalism. That represented the biggest week for economic coverage since April 11-17, when the narrowly averted government shutdown helped to make that subject the focus of 39% of the newshole. The growing sense that the economic recovery has stalled invited the media to weigh the impact on President Obama, with analysts noting that his reelection prospects were not helped by last week’s news. The week’s No. 2 story was a related subject—the 2012 presidential election—that has slowly but steadily crept to the fore of the mainstream media agenda. Last week, attention to the race—mostly focusing on the emerging and potential crop of Republican candidates—accounted for 12% of the newshole, its biggest week of coverage yet. Former Massachusetts governor Mitt Romney generated substantial attention with his long-expected entrance into the race on June 2. (He was the No. 2 lead newsmaker last week, the focus of 4% of all stories studied by PEJ). Another former governor—the undeclared Sarah Palin—generated considerable coverage as she launched a bus tour of some of the nation’s famous historical sites that had the media fervently chasing her. Palin was the No. 3 newsmaker, also at 4%. (In order to register as a dominant newsmaker, a person must be featured in at least 50% of a story). The lurid side of American politics was also on display as the media focused on two scandals last week. The No. 4 story (4%) involved the indictment of former vice presidential nominee John Edwards on charges that he misused campaign funds to conceal an affair with his mistress. At No. 5 (also 4%) was the appearance of a revealing image on the Twitter account of New York Rep. Anthony Weiner—a scandal that lingered when the congressman could not say with certitude that the photo was not of him. (On June 6, Weiner admitted the photo was of him and said that he had inappropriate communications with a half dozen women). Turmoil in the Middle East surfaced again among the top stories last week as violence in Yemen and the departure of that country’s president to Saudi Arabia sparked concerns of all-out civil war. That topic was the No. 3 story, at 9% of the newshole. And one week after the deadly tornado that devastated Joplin, Missouri was the No. 1 story, bad weather continued to make news last week. That aftermath of the Joplin disaster filled 3% of the newshole, while additional flooding and tornadoes—including one that killed several in Springfield, Massachusetts—accounted for another 2%. The media’s mood about the state of the economy darkened last week, as disappointing employment numbers added to an already gloomy report on the housing sector. “The economy clearly just hit a brick wall” said economist Paul Ashworth, quoted in a New York Times June 3 piece about hiring numbers. The Labor Department on Friday reported that only 54,000 jobs had been added, about a third of what economists had been expecting. It was also reported that the unemployment rate went up to 9.1% in May. The news wasn’t any better on the housing front. “The double-dip that everyone was worried about is here, with home prices falling to their lowest level in nine years,” reported a sober George Stephanopoulos on the June 1 edition of ABC’s Good Morning America. Meanwhile, the media continued to cover the partisan conflict on Capitol Hill about raising the nation’s debt ceiling. Last week Republican lawmakers introduced a measure to raise the debt ceiling only to overwhelmingly vote it down. Democratic lawmakers called it political theater. But it set the tone for Obama’s meeting with House Speaker John Boehner and other House Republican leaders about the matter. A Fox News report summarized the Republican reaction to the meeting: “Sources say in today’s meeting the speaker pushed the president on where his debt crisis proposal is, and in the end, lawmakers sounded disappointed.” The following day, the Moody’s credit rating agency reported that it was considering downgrading the U.S. credit rating. Given the increased attention to the 2012 campaign, the grim economic news was treated as a political story by a number of journalists last week. “President Obama is trying to put the jobs picture in the best possible light, but right now it’s casting a shadow on his reelection campaign” said CNN’s Wolf Blitzer on the June 3 Situation Room program. The Wall Street Journal reported that day that Romney would try to position himself as someone qualified to handle a troubled economy. “The launch came at an uncertain time for the U.S. economy but an auspicious moment for a candidate who has made job creation and economic growth the focus of his campaign,” the story stated. But Romney had to share the spotlight with Palin, whose refusal to disclose her presidential plans did little to stem media interest. The phenomenon was so pronounced that much of the political coverage of Palin consisted of the media talking about themselves. On June 1, CBS political reporter Jan Crawford described the media frenzy surrounding the possible presidential candidate on her bus tour that started with the Rolling Thunder biker rally to commemorate veterans on the Memorial Day holiday. “And all the way, reporters were chasing behind her with the same question”—whether she would run for president. “Her tour is really stealing the political thunder from some of the other prospective candidates. With Michele Bachmann in New Hampshire today, Tim Pawlenty in Iowa, most of the media focus instead was on Palin,” said Crawford. Not only would Palin not commit to a presidential run, she would also not reveal her tour schedule with members of the press, who complained about being left out of the loop. “I don’t think I owe anything to the mainstream media,” the former Alaska governor said to Fox News host Greta Van Susteren in a May 30 interview. Even so, the press managed to follow her from Washington to Gettysburg, Pennsylvania, then to Baltimore’s Fort McHenry and then Philadelphia and New York City for a lunch with Donald Trump. Palin made some unwelcome news at a June 2 stop in Boston. Asked by the press to reflect on the historical significance of Revolutionary War hero Paul Revere, her recounting of his famous ride was dissected, and mocked in many quarters, for a questionable adherence to the historical facts. Two political scandals made headlines last week, one the No. 4 story, the other at No. 5. On Friday, former vice presidential nominee and South Carolina Democratic Senator John Edwards was indicted in the latest chapter in a long narrative of decline and fall from public grace. As bad news about the economy mounted last week, Obama edged out two possible Republican challengers in registering as the top newsmaker. 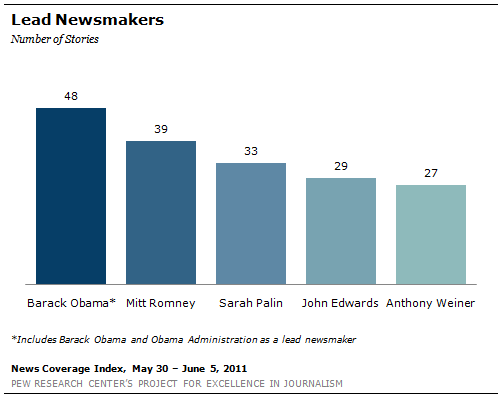 He was the lead newsmaker in 5% of stories studied by PEJ between May 30 and June 5. The No. 2 newsmaker was Mitt Romney (4%) as the former governor of Massachusetts announced his bid for the presidency. Sarah Palin, the No. 3 newsmaker at 4%, maintained she was not launching a campaign, but rather on a family vacation that just happened to stop in the Granite State on Romney’s big day. Finally, at No. 4 and No. 5, were John Edwards and Anthony Weiner, two men who certainly would have preferred to avoid the headlines last week. They were each the focus of 3% of stories.